CAMBRIDGE, UK – The University of Cambridge, is one of the oldest and most prestigious universities in the world, counting giants from science (Isaac Newton and Stephen Hawking went here), music and the arts among its alumni. It’s only fitting then, that in 2012, almost one thousand years after the school’s founding, its hometown celebrated this cultural and scientific heritage by playing host to e-Luminate, a week-long lighting festival aimed at connecting art and technology through the medium of light. 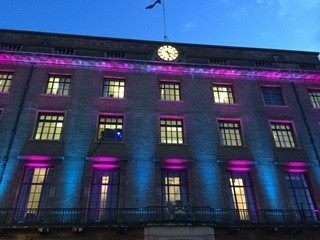 Among the highlights of this year’s event was a richly colored lighting display on historic Guildhall that was created with a collection of Iluminarc fixtures from Chauvet. 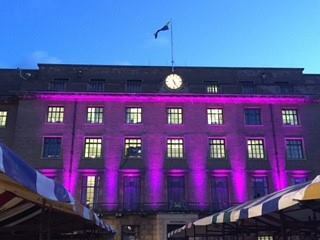 A Victorian style natural stone building located in the centre of historic Cambridge and owned by the city, Guildhall provided an ideal backdrop for the interplay of vivid hues produced by the Colorist Pod 7Qa and Colorist Panel 8Q. Strategically positioned on the building’s balcony by lighting designer Simon Cox, the RGBA fixtures accented the distinctive architectural features of the popular Cambridge landmark. The whole design was programmed by Cox and run on CHAUVET Professional ShowXpress software. Utilizing the programming power of this software, Cox, built up the façade in one color and then built down linking in to the next part of the color sequence. Further linking looks were utilized to offer big blocks of color and alternate split color states between the columns and window bays. Among the many functions that Guildhall serves at Cambridge is to serve as a site for the university’s examinations. 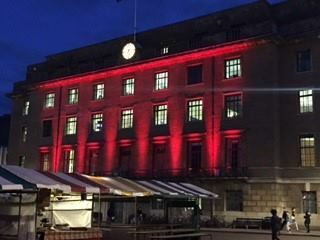 Although the Cambridge e-Luminate Festival was not a test, it was readily apparent to anyone who saw this venerable building during this event that Simon Cox’s interlocking lighting design clearly made the grade.